Buffalo wings is an American chicken recipe and the reason why it is called Buffalo Wings is because it was created in Buffalo, New York. So don’t make any comment asking me why it is called buffalo wings since buffaloes doesn’t have wings (just kidding 🙂 ) . 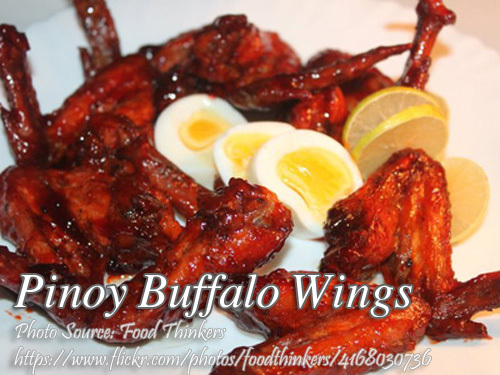 This buffalo wings recipe is a Pinoy version because it uses banana ketchup, calamansi juice instead of lemon juice but you can use lemon juice as an alternative and of course our very own Magic Sarap that can make dishes yummy even though it looks yucky (again….just kidding 🙂 ). Original buffalo wings recipe doesn’t have any cornstarch coating while frying the chicken wings but this extra step makes the chicken more juicy, tender and crispy. Buffalo wings is an American chicken recipe and the reason why it is called Buffalo Wings is because it was created in Buffalo, New York. Wash the chicken wings and remove the any tiny feathers and cut the toenail at the tip. Drain any excess water of the washed chicken then coat them with calamansi juice, salt, Magic Sarap and pepper. Marinate for at least 1 hour for best result. In a deep frying pan, heat some cooking oil, just enough to cover the chicken wings while deep frying. Coat the chicken wings with cornstarch before frying. You can use a strong plastic bag then shake and coat the chicken with cornstarch. Then deep fry the chicken wings until golden brown. Drain the excess oil in a strainer or paper towel. In a saucepan, melt the margarine and add in the hot sauce, calamansi juice and banana ketchup. Mix very well and simmer for a few seconds. Then add in the fried chicken wings and stir cook until each have been well coated with the sauce. Good day! What hot sauce would you reccommend for this recipe? ☺️ I wanted to make 2 different batches…one really spicy and one not that spicy. What would you use for the other not really spicy buffalo wings? Thank you. Hi, just reduce the amount of hot sauce on the second batch to make it less spicy. For example, instead of using 1/4 cup hot sauce, you can use 1/8 cup. the sauce will be best with mince garlic (4-6cloves) while you melt the butter/margarine. Hi Hgiel, thanks for the nice tip!